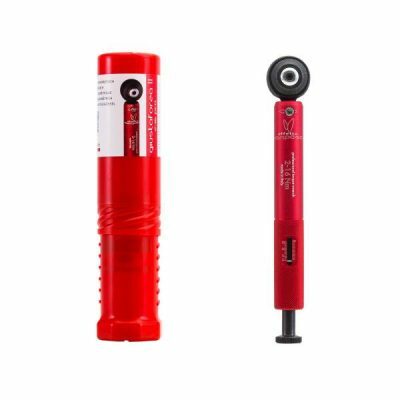 Are you looking to get a high quality torque wrench for your bike? If you have a carbon bike frame or use carbon components, the torque wrench is an essential part of your tool kit. It enables you to tighten a bolt to precisely the torque the manufacturer recommends. Even the most experienced bike mechanics use them and you should too. Do You Really Need A Torque Wrench? Sometimes, it’d be easy to overlook the importance of a torque wrench or think they are too expensive. But if you’re working on a bike that worth thousands, surely spending a little on a tool that helps maintain it makes good sense? So, here are the 10 best bike torque wrenches you can consider. Topeak is another name synonymous with quality bike accessories and tools. The set comes with a torque bit for 4Nm, 5Nm and 6Nm. The Topeak Nano TorqBar DX is a rugged but stylish bike tool with storage for two tools along with the wrench itself. The construction is rugged but top quality. It’s easy and reassuring to use with a faint click when you hit the target torque value. The Topeak Nano TorqBar DX can fit into a jersey pocket as well as a tool bag if necessary. It doesn’t come cheap, but you can be assured of a top quality torque wrench. 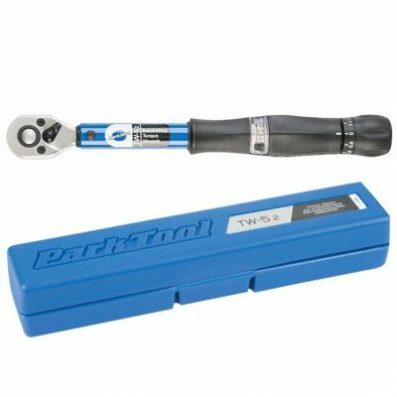 The Park Tool ATD 1.2 is made by market leader Park Tools whose toolkits are used by many pro mechanics. When you get hands on with one you quickly see why. This is a combination of preset and adjustable torque, ranging between 4 to 6Nm, in half Nm increments. It is constructed of steel and plastic and is rugged enough to survive any workshop. Increments are simple to dial in and the handle is large enough for most hands. The Park Tool ATD 1.2 is not cheap but then tools are an investment. If you want something that could outlast your bike, this could be it. 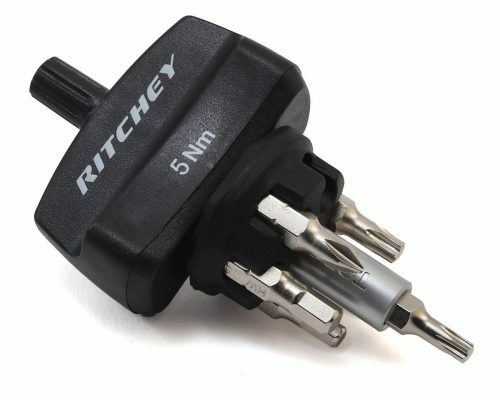 The Ritchey Torque Key is yet another solid choice for torque wrench. Well made, rugged, can torque to exactly 5Nm and it includes a neat holder for extra convenience. Sure there is a 5Nm limit but most carbon components won’t exceed that anyway. The key is well designed but not as comfortable in the hand as the Topeak or Park Tool. That said, it is smaller and lighter, so if you’re planning to carry it this might be the one for you. 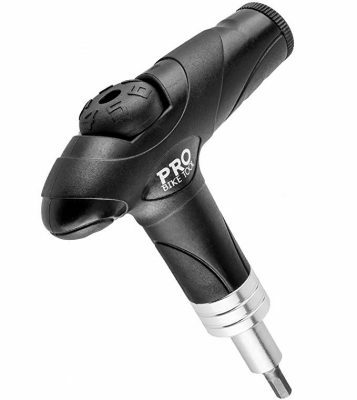 This adjustable torque wrench from Pro Bike Tool looks the business. The design is cool, the build quality superb and you have storage for bits too. It’s accurate with three settings at 4, 5 and 6Nm with nothing in-between. If you’re on a budget, this or the Ritchey is what I’d recommend. It is light, simple to use and include the three main torque settings for road bikes. The TW-5.2 is the newest click wrench from Park Tool and performs admirably. It’ss very well built, easy to handle, the grip sits comfortably in the hand and it is capable of between 2-14Nm. That should cover everything on a road or mountain bike. The dial adjust gives a reassuring click when you set it and a clearly audible click when you hit the correct settings. About as easy as it gets. You do pay for the privilege of owning Park Tools but you know what they say, buy quality, buy once! 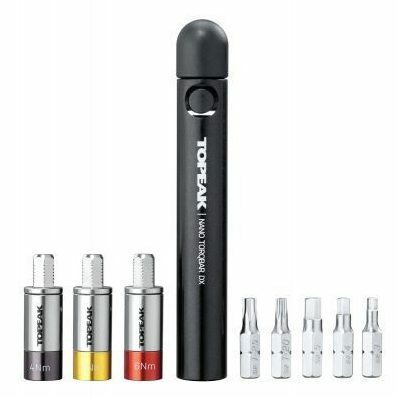 The Topeak D-Torq is a premium digital torque wrench for the cyclist who has everything. It’s an expensive proposition but it looks the business and offers simple programmable torque settings and a clear LCD display. Build quality is superb with great quality materials, comfortable handle and accurate measurement. It has the advantage of being able to measure in Nm/kg, Nm/cm, inch/lbs and ft/lbs for the geeks. It is exceptionally expensive though and requires an AA battery to work. That’s yet another battery to keep an eye on in a workshop potentially full of them! The Feedback Sports Torque Ratchet is relatively new to the market. But once you get your hands on it, you quickly realize it’s up there with Park Tool or Topeak. The attractive red and black design and case with a bunch of tools makes it even more attractive given the price. Construction is of a high quality, measurement is accurate between 2-10Nm and the case it very useful for keeping tools together and clean. The build quality, while good, isn’t quite up there with the above two. The measurement is also a little more difficult to set. This is offset by the inclusion of a range of tools to use with the wrench. 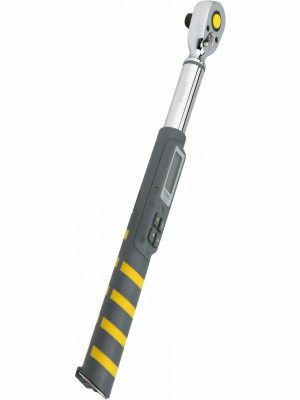 The Effetto Mariposa Giustaforza 2 is a good looking torque wrench with its own case and includes a ton of tools to use with it. It’s accurate between 2-16Nm, easy to set and comes with most popular Torx and Hex heads to use with it. The case isn’t the most hard wearing and you will shed a tear when you drop your first bit of grease or drop of oil on it. Otherwise, this tool is precision engineered and will last a lifetime. The Craftsman Beam Torque Wrench is a solid wrench with a good range of 4, 4.5, 5, 5.5, or 6Nm and a decent length handle. It’s not too big or too heavy and can easily fit into a basic toolbox or bag. The scale is clear but small and could be a challenge for those with poor eyesight. It also means you have to keep the scale very clean, so if you’re a mucky mechanic, be warned! Otherwise, the Craftsman is a good torque wrench at a decent price and will cover all torque levels your bike will require. The Performance Tool M195 is similar to the Craftsman in looks and operation but comes in a variety of torques. You can select from 4, 5, 6Nm. As long as you select the correct range, this is another solid option for a beam torque wrench. The Performance Tool M195 is clear, easy to read and seems to be accurate. 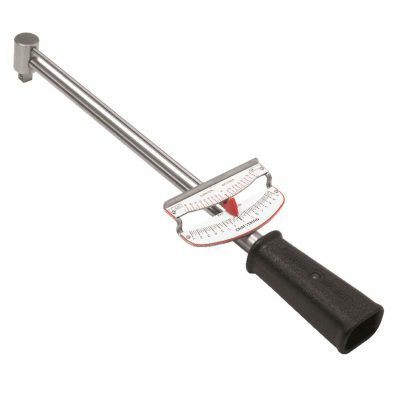 As long as you store it safely, keep the scale clean and pay attention, this is one of the better beam wrenches you can buy. Torque wrenches help you tighten a bolt enough to remain safe and secure but not so much that you stress the component by over tightening it. You may think tighter is always better but you won’t when you crush your new stem or seat post because you tightened the bolt too much! Over tightening can weaken and even shear bolts. It can also crush steel, aluminum and carbon frames and components. While steel and aluminum are both susceptible to over-tightening, it’s carbon fiber that you really have to watch out for. Carbon fiber is an incredibly strong material in the direction it needs to be. Bike frames, stems, bars and seat posts all have the carbon fibers laid in a particular direction to provide the strength and flexibility in that direction. Apply pressure in a different direction and you would be amazed at how little effort it takes to damage it. Don’t try this at home but you can theoretically crack a carbon seat post just by bending it with your hands! Carbon fiber needs very careful handling. Tighten a bolt on a carbon part too much and you could crush the fibers and render the component unusable. Warranty won’t cover that kind of damage. Given how much carbon parts cost, we certainly don’t want that! So yes, if you want to correctly maintain your bike and keep it safe, you do need a torque wrench. Think of it as an investment in your safety in the same way you would brakes or a helmet. It helps you maintain the correct level of tightness while helping you avoid damaging components or leaving them too loose as to be a hazard. Neither of which you want to experience when riding along a busy road at 30 miles per hour. Preset torque wrenches are exactly that. They come preset with their torque measurements. The most common preset torque value is 5nm which is what the majority of manufacturers recommend for tightening the seatpost, saddle, stem and handlebars. Pros. They are simple, easy to use and good to keep around the workshop. They look like a standard T-wrench with an Allen key or bolt on the end. 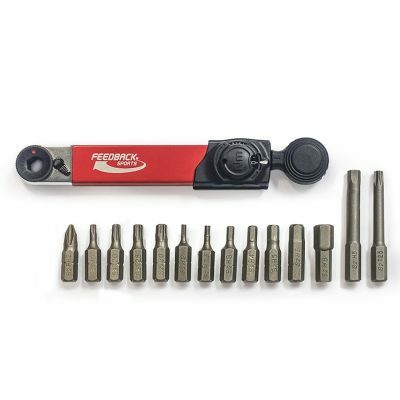 You twist the tool to tighten and it will click when the desired torque has been reached. Cons. Each tool can only tighten to a single torque value (5Nm), so you’ll need different preset torque wrenches for a other torques values such as 4Nm or 6Nm. 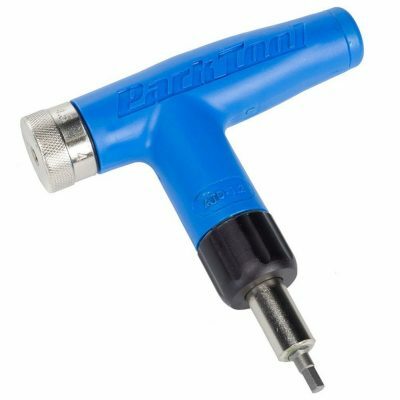 Click torque wrenches are the most popular among bike mechanics. I’m sure you’d probably come across them in your local bike shops too. They cover a range of torque values from 2nm right up to 16nm or more, depending on the models. Pros. The benefits of a click torque wrench is in its ease of use and ubiquity. You set the intended torque value and tighten until you hear a click sound. Cons. They can require calibration which means sending it back to the manufacturer. You also have to take care to set that torque dial accurately as some dials can be tricky to use, especially on cheaper models. Beam torque wrenches are old school tools that use a simple indicator and scale to show you the current torque. It’s needs no calibration, has no real internals and gets the job done. Pros. It’s an extremely simple setup, you have the socket at one end and a needle and scale at the other. As you tighten the bolt, the needle moves across the scale to indicate how much torque you are applying. Cons. The downside is that it cannot be preset so you have to pay attention when tightening and you may have to buy an automotive tool as they aren’t readily available as road bike specific tools.